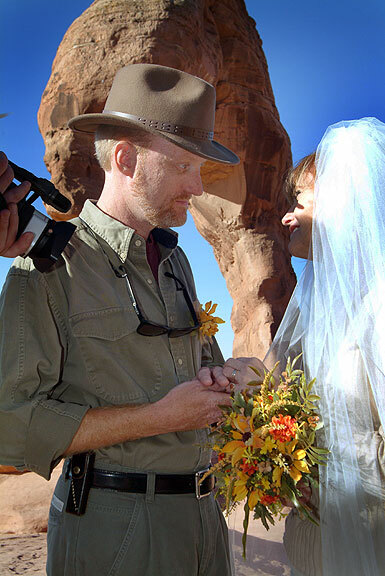 Abby and I smile as we exchange wedding vows at the majestic Delicate Arch in Utah’s Arches National Park. 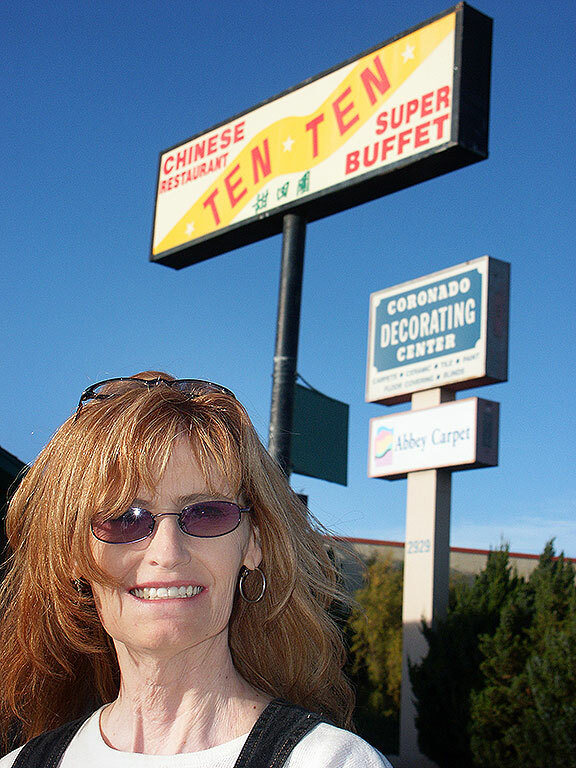 Abby smiles at Ten Ten Chinese Restaurant in Santa Fe, New Mexico, where we enjoyed a meal more than a year earlier on our first vacation together. 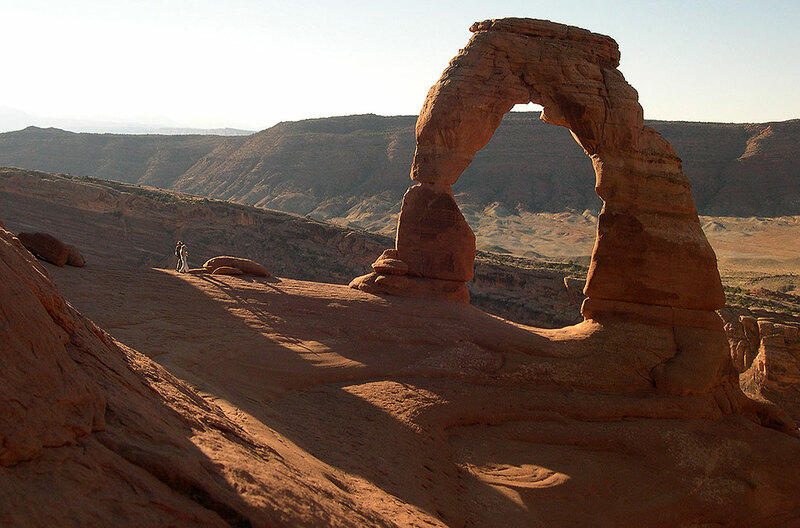 Abby and I discussed many options for when and where to get married, and we finally decided on a very special and beautiful place, Delicate Arch in Arches National Park, near Moab, Utah. Abby’s parents got married on October 12, and since early autumn seemed like a perfect time for an outdoor wedding, we agreed to that date. 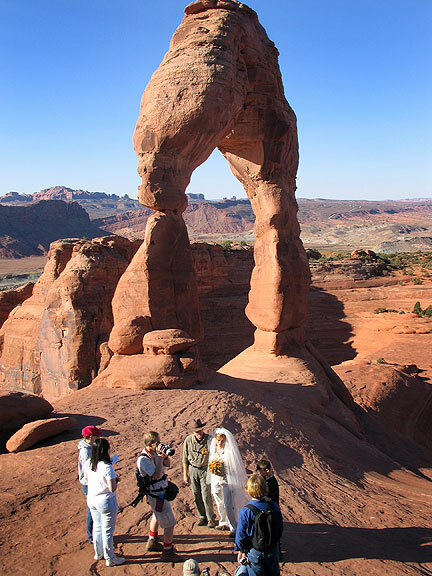 With a few friends and relatives meeting us in Moab, we exchanged vows at one of the most beautiful places on earth. 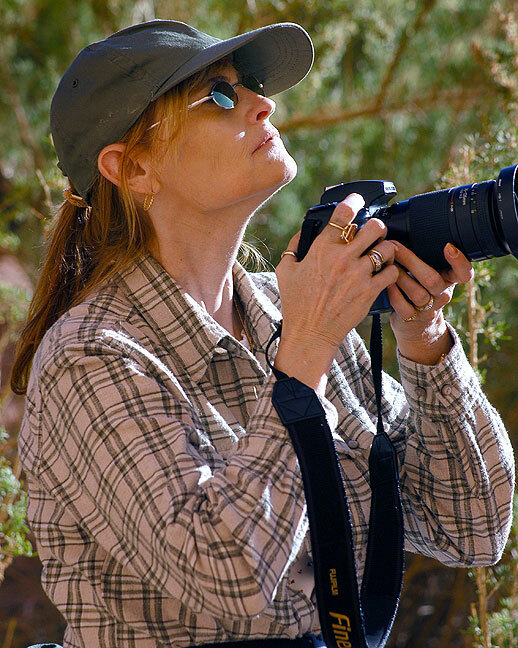 We convoyed with a friend and fellow photographer David to Farmington, New Mexico, stopping for dinner at Ten Ten Chinese restaurant in Santa Fe, where Abby and I ate on our first vacation together, The High Road, in 2003. We all had a good trip, and were very excited about the upcoming events. 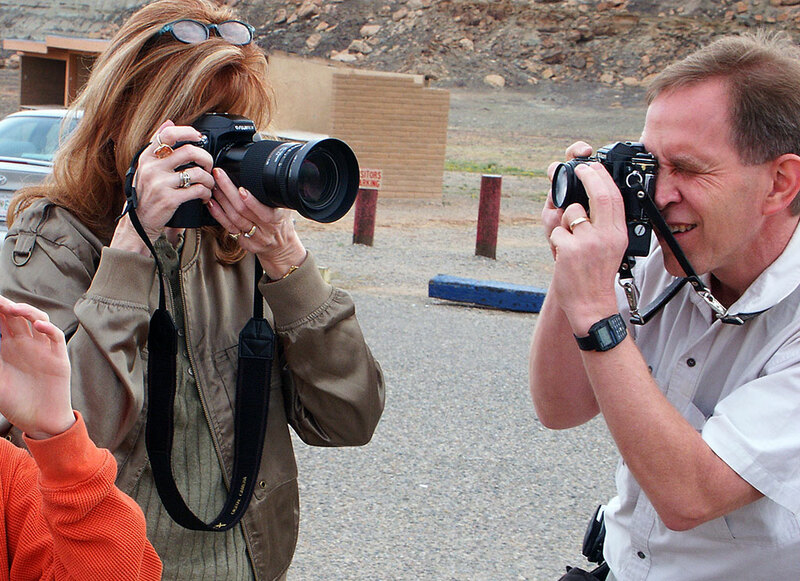 Abby and David take pictures at Four Corners Monument. We drove north from Farmington, stopping first at Four Corners National Monument. 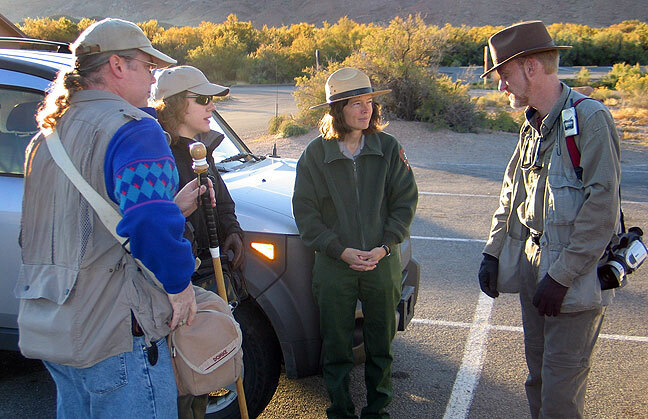 The author makes video at Four Corners Monument. 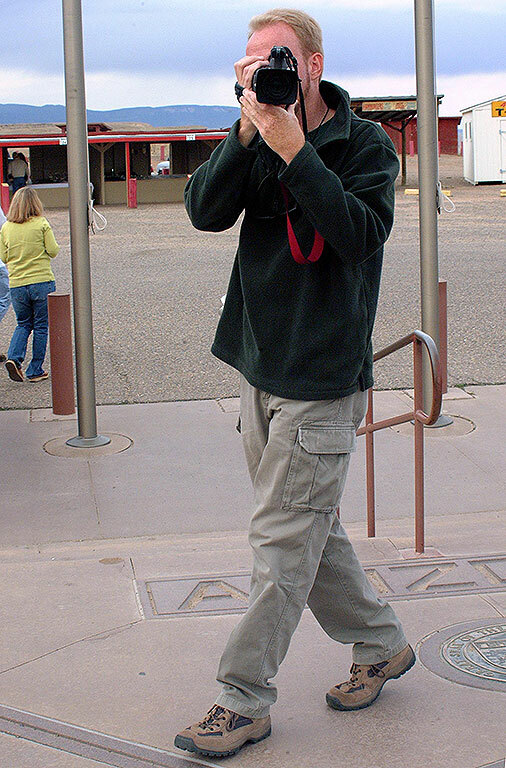 Richard videographs Abby as she makes pictures as Four Corners Monument. Wilson Arch south of Moab, Utah was next. We hiked all around the arch and had fun. Not far up the road was Hole ‘N the Rock, a tourist stop that was funny to see. 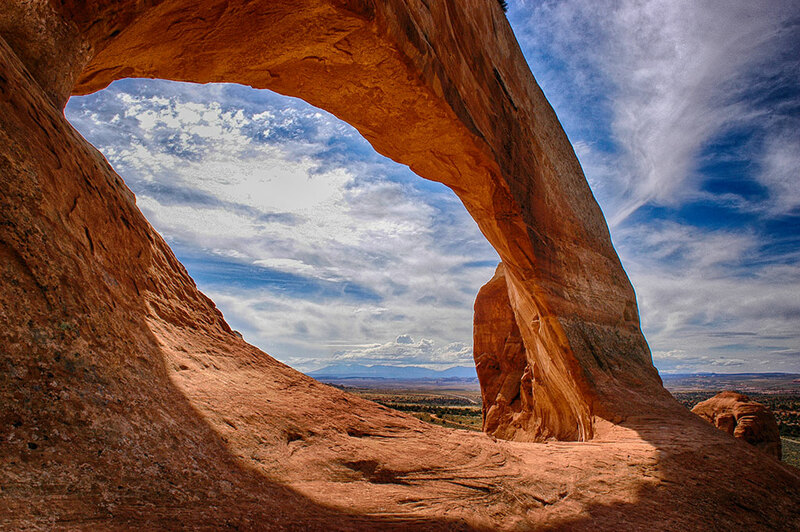 The beautiful and easily-accessed Wilson Arch south of Moab, Utah on U.S. 191 stands against a perfect autumn sky. 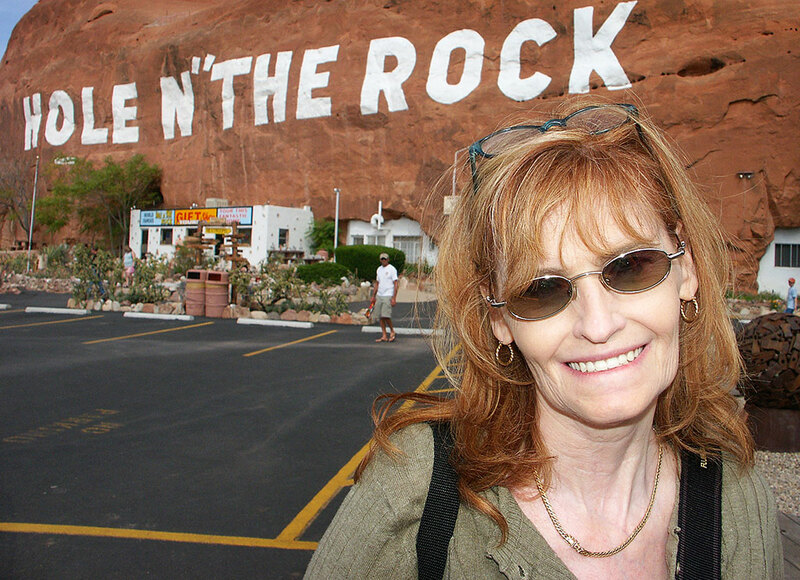 Abby smiles at Hole ‘N the Rock, a tourist stop south of Moab, Utah. 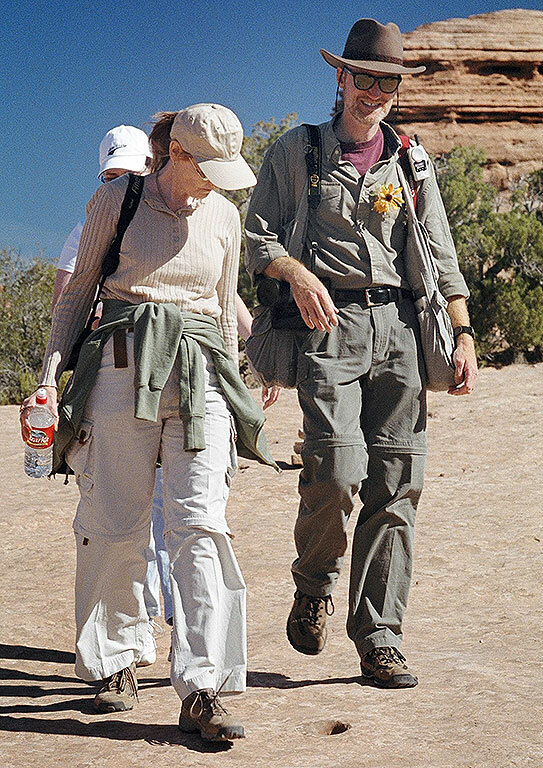 After lunch in Moab, we hiked for a while in Arches, in the Devil’s Garden section. 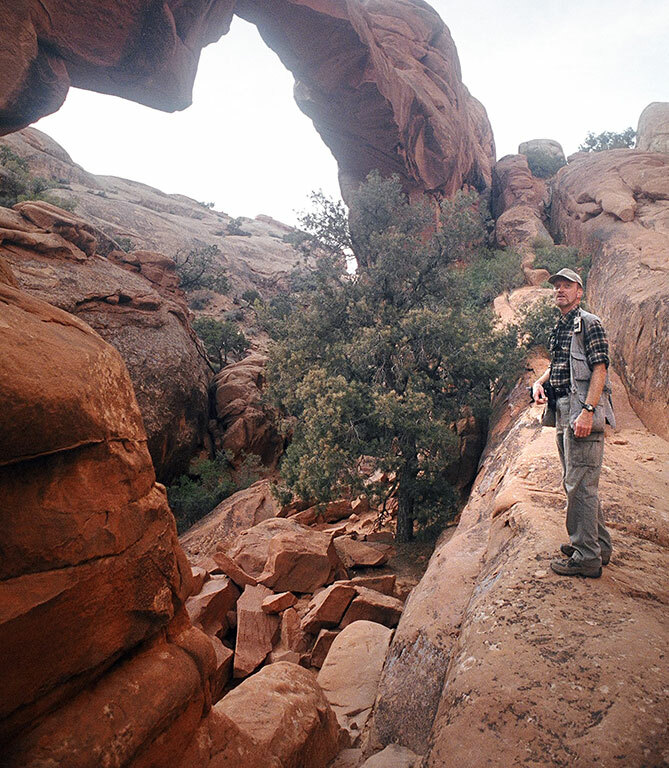 Your host stands near the opening of Wall Arch at Arches National Park, which collapsed four years later. Abby takes a break as we hike in the Devil’s Garden at Arches National Park. 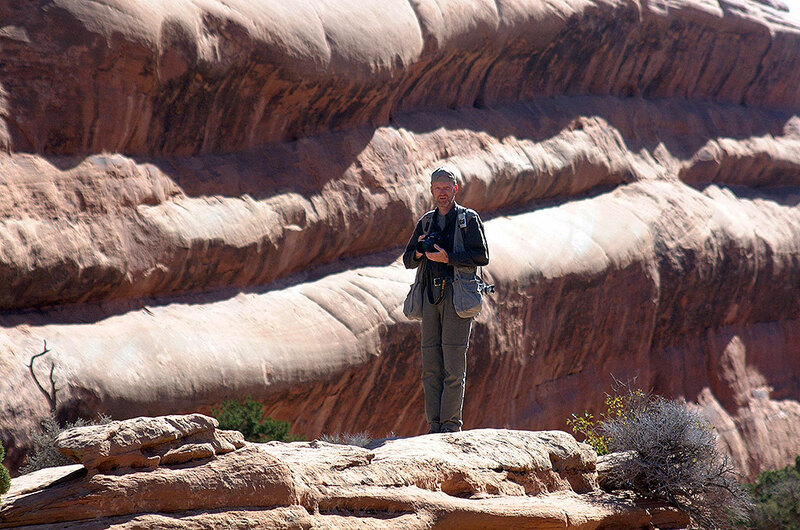 The author prowls the majesty of Arches National Park’s Devil’s Garden section for photos. 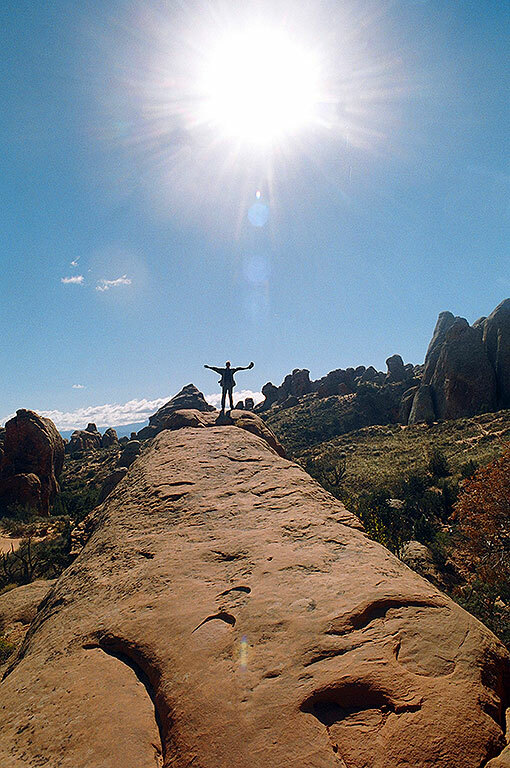 The author stands at the end of a sandstone fin in the Devil’s Garden section of Arches National Park, Utah. 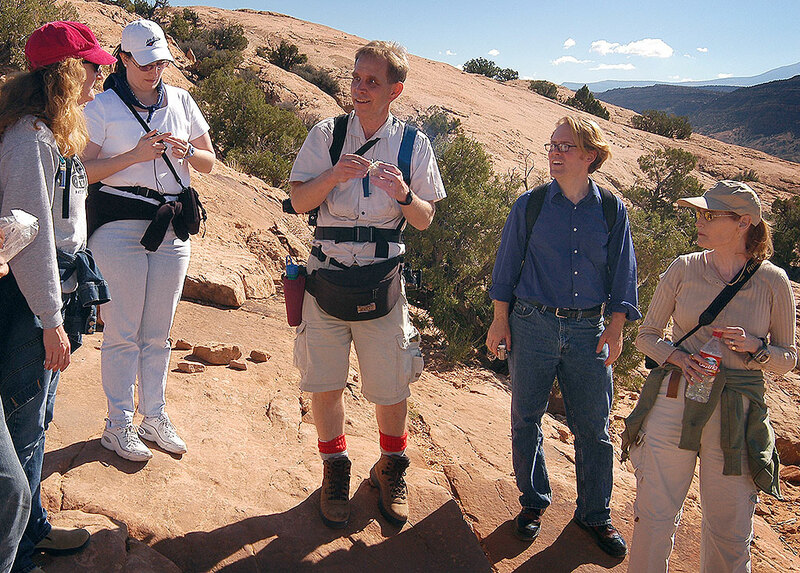 Our entourage gathers at the Delicate Arch trail head. The actual hike to Delicate Arch was the easiest of the hikes we made. There were several inexperienced hikers with us, but everyone did fine. 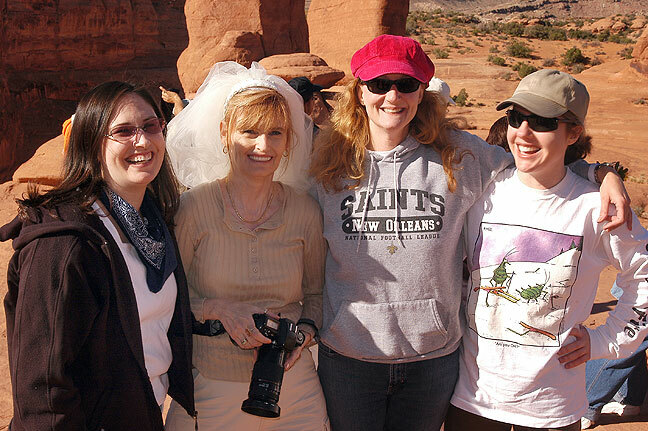 Some of the members of our wedding party gather for a water break on the Delicate Arch trail. From left are Nicole, Chele, David, Robert, and Abby. Chele and Nicole prepare Abby for the wedding ceremony. 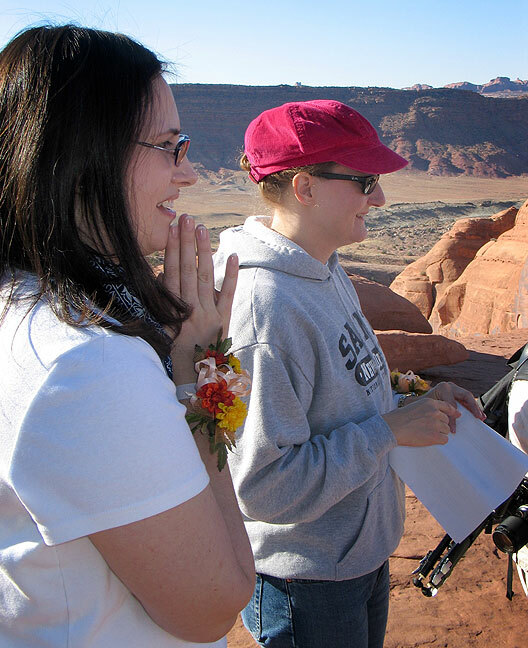 Chele and Nicole conduct our Delicate Arch ceremony. 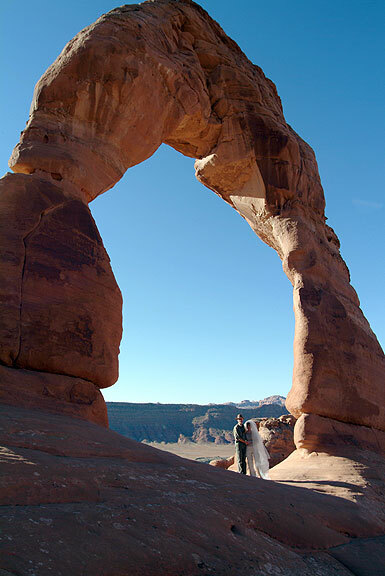 We enjoyed a nearly private wedding ceremony at the Delicate Arch that was both simple and very emotional. 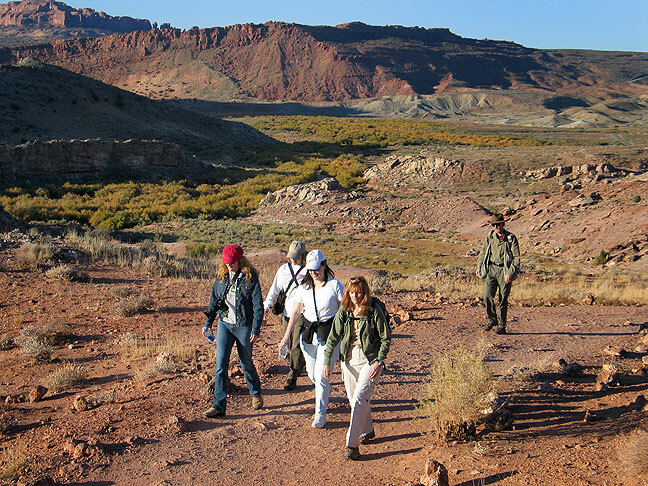 We were treated to pearl blue skies and moderate temperatures for the hike, which included Park Ranger Annie Corson, Abby, me, Chele, Nicole, Michael, Thea, David, surprise guest Robert, and others. Chele and Nicole, who were both ordained by the Universal Life Church, conducted the ceremony. Robert, right, shares a traditional wedding story with the group. Richard and Abby look into each other’s eyes during the ceremony. Chele and Nicole conduct the ceremony while David makes video. Richard and Abby pose for a photo beneath Delicate Arch. 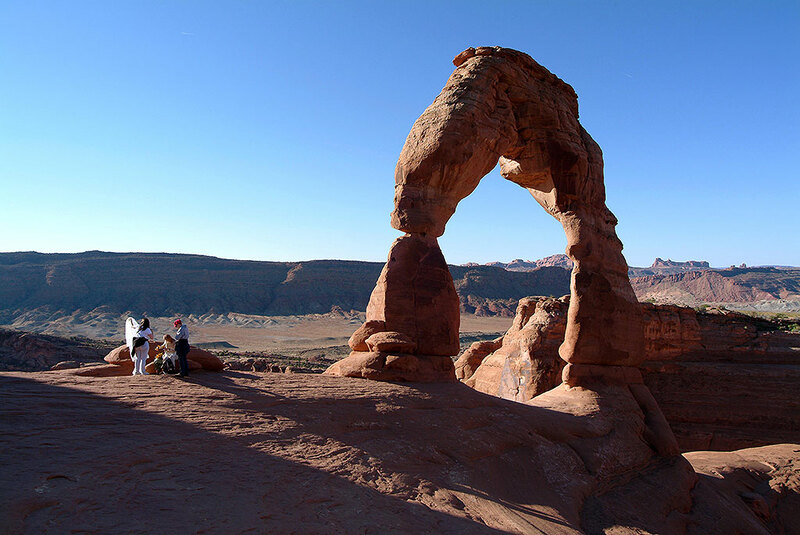 National Park regulations stipulate that we couldn’t spend more than ten minutes at a time under or directly next to Delicate Arch, but many of the other visitors were happy to wait, and even wanted to be a part of it, as in this view immediately after our exchange of vows. Abby holds her camera moments after the wedding ceremony. The ladies share a happy moment after our wedding ceremony. After the wedding ceremony, several of us hiked to the sandstone “bowl” below Delicate Arch to photograph it, including this image. The newlyweds make their way back down to the trail head. 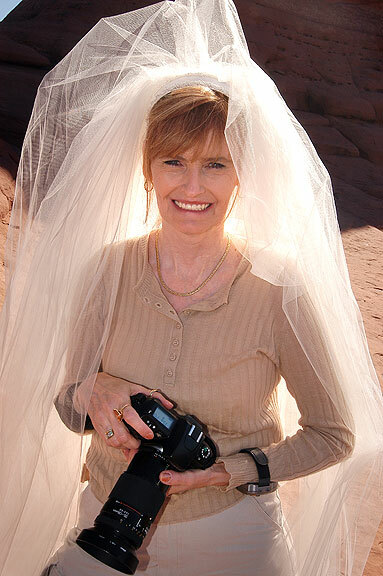 After the ceremony, we had a good hike down and out, followed by lunch in Moab and the legal marriage ceremony at the Grand County Courthouse. 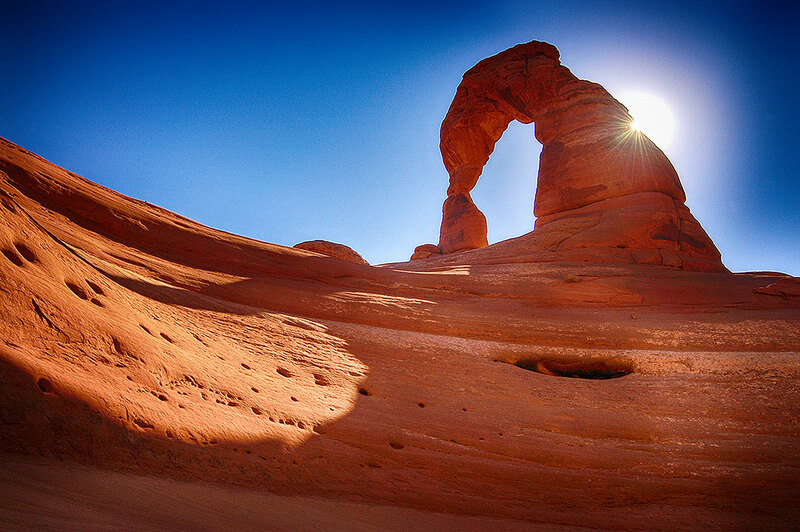 Unknown to us ahead of time, Delicate Arch appears on our marriage license. Richard and Abby complete their wedding day at the Grand County Courthouse. 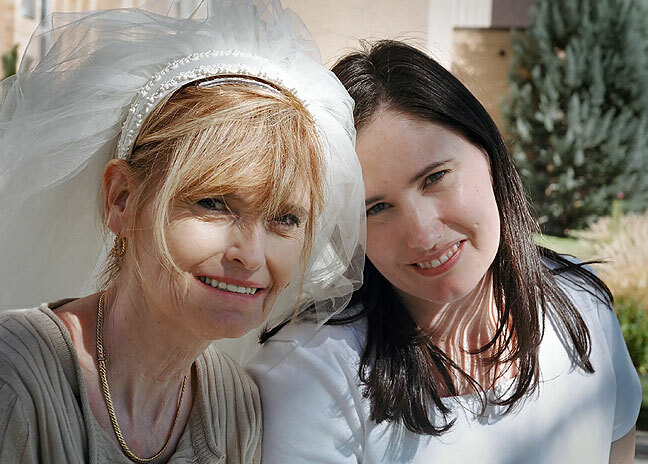 A beautiful mother and daughter image: Abby and Chele on the lawn at the Grand County Courthouse. 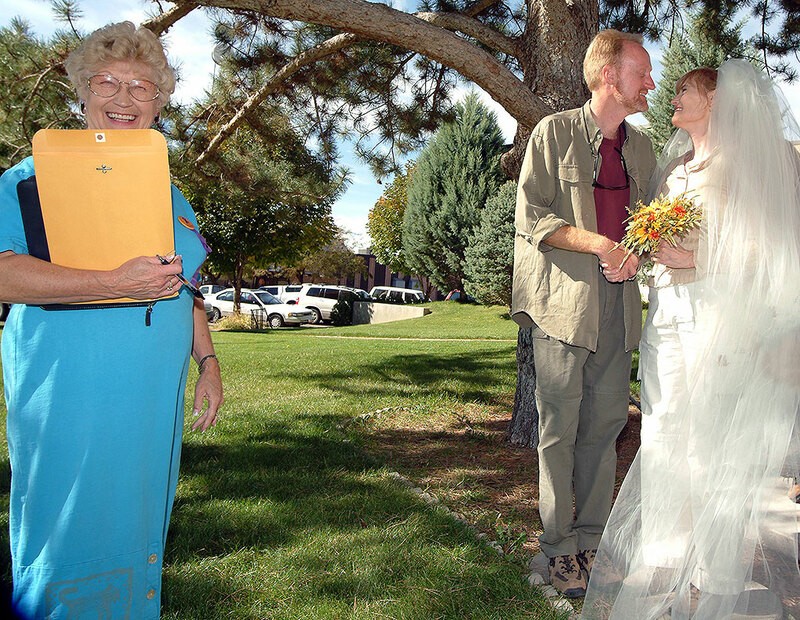 Grand County Judge Fran Townsend gave us a second wedding ceremony on the courthouse lawn. Cliffs of the Park Avenue trail at Arches stand in handsome afternoon light. Robert, David and I had a solid though easy hike down the Park Avenue trail. The rest of the crew returned to Moab for a nap. 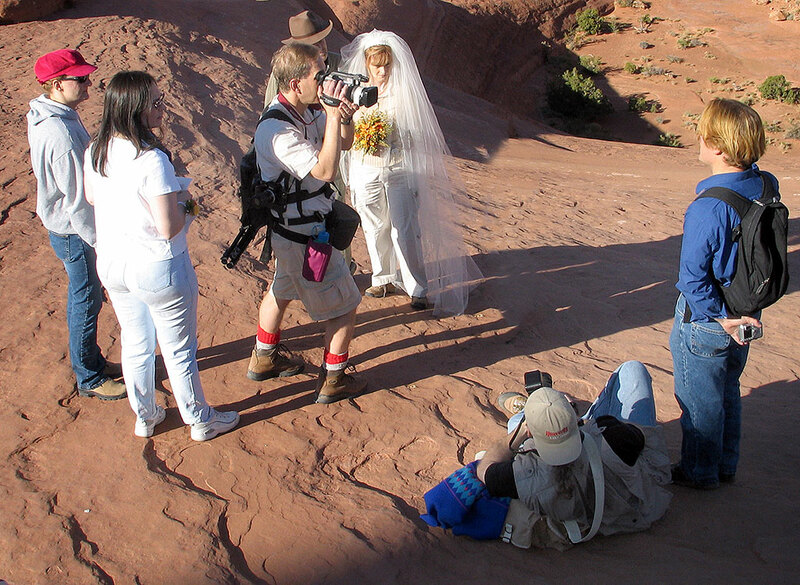 By evening, we all gathered for shooting the golden moment at Balanced Rock. 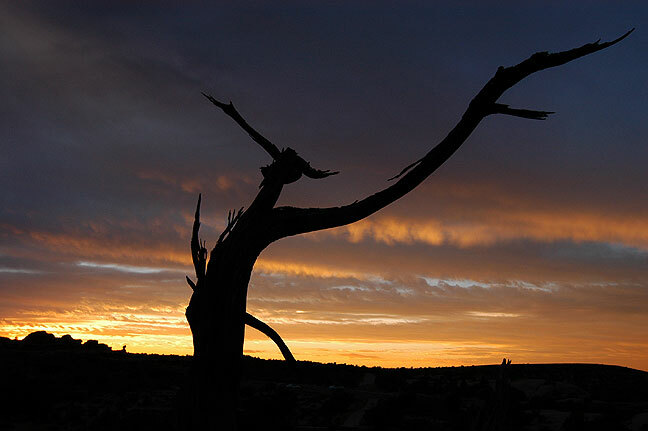 A dead tree stands against a beautiful after-sunset sky near Balanced Rock at Arches. “That was the most beautiful wedding I have ever seen,” Nicole told me on the phone later. Abby wears her hood against a cold wind in the Devil’s Garden. 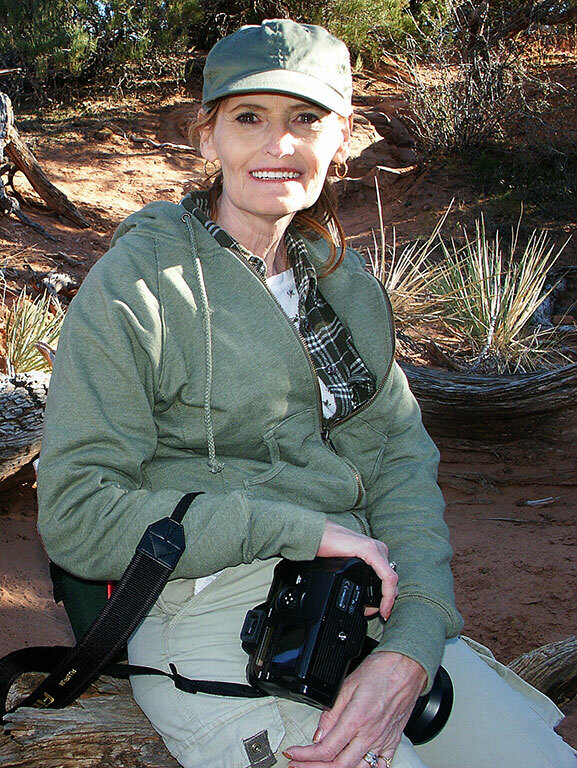 We had a giant hiking day in the Devil’s Garden, at first in whipping wind. We reached the Dark Angel at the end of the trail, then returned via the Primitive Loop Trail, which was difficult in spots and extraordinarily beautiful. 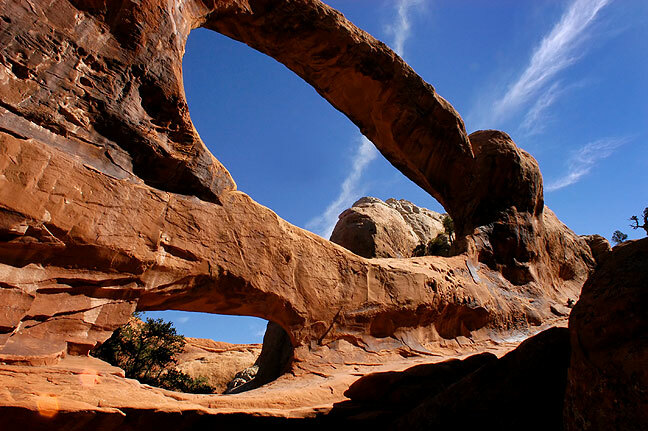 This image shows Double-O Arch in the heart of the Devil’s Garden at Arches. 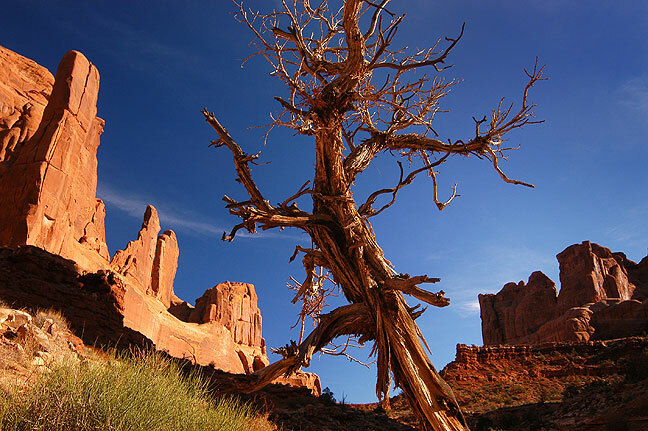 At the end of a spur trail on the Primitive Loop at Arches is the Dark Angel spire. 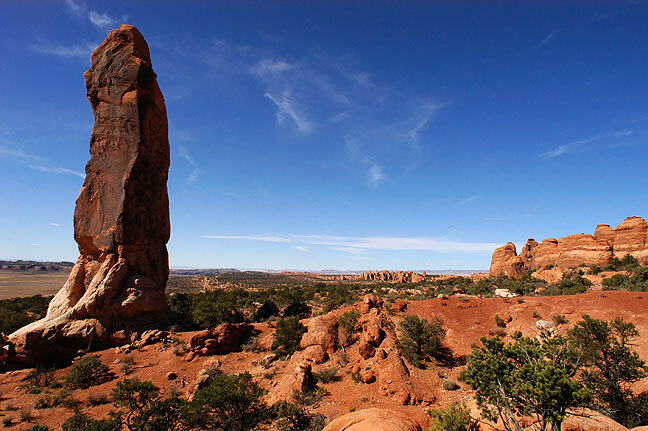 The Dark Angel spire, at the end of a spur trail on Arches’ Primitive Loop trail, is shown in Abby’s sunglasses. The Primitive Loop leads past this location, overlooking Black Arch. Skyline Arch takes on a deep amber hue at sunset in Arches National Park. 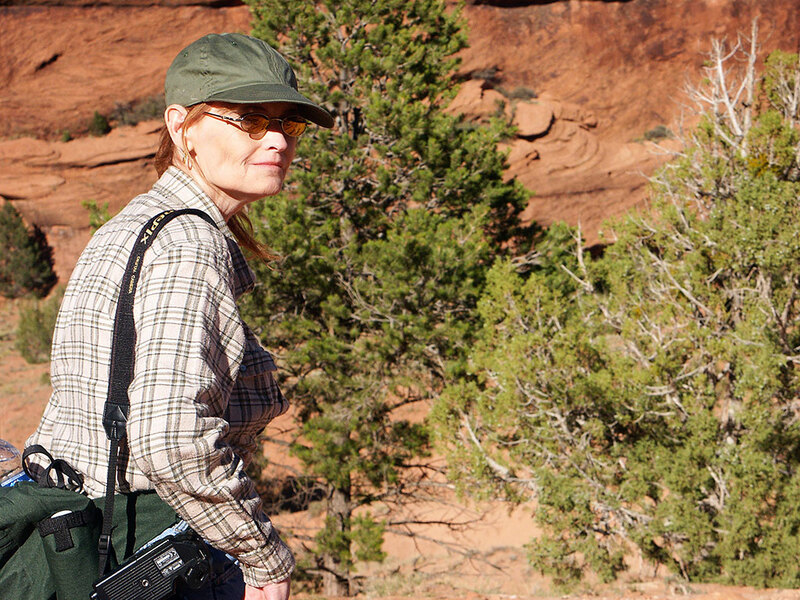 We drove without haste to Canyon de Chelly, where we hiked to the White House Ruin. It was a fine end to a perfect wedding trip. 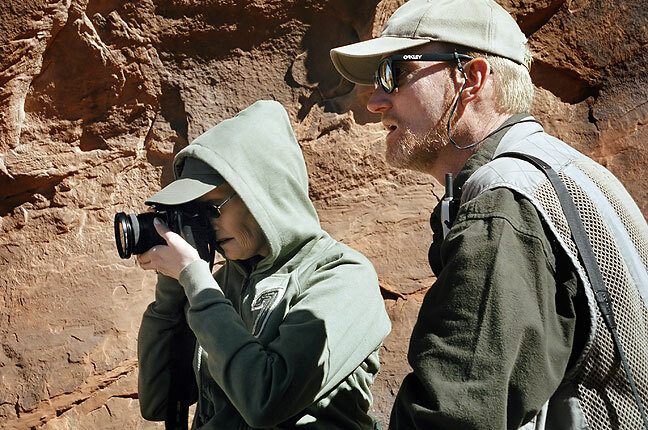 Abby makes pictures at the White House Ruin at Canyon de Chelly National Monument in Arizona. 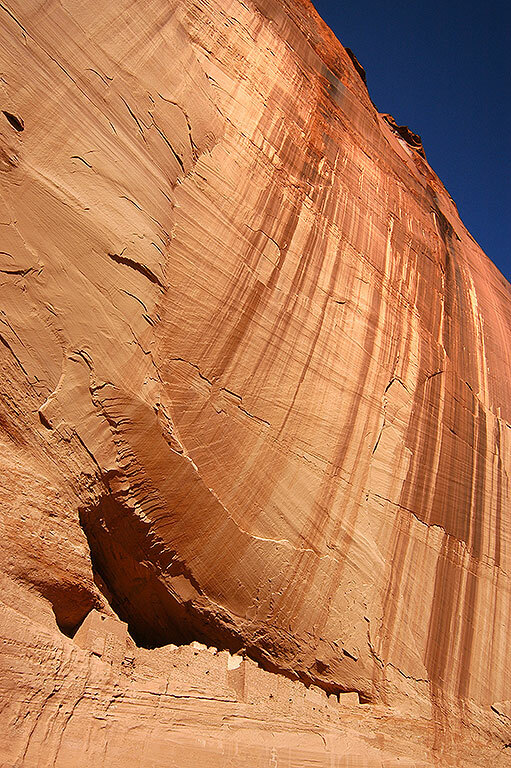 Abby looks up at the massive sandstone cliffs of Arizona’s Canyon de Chelly National Monument. The White House Ruin at Canyon de Chelly in Arizona shines in the afternoon sun. 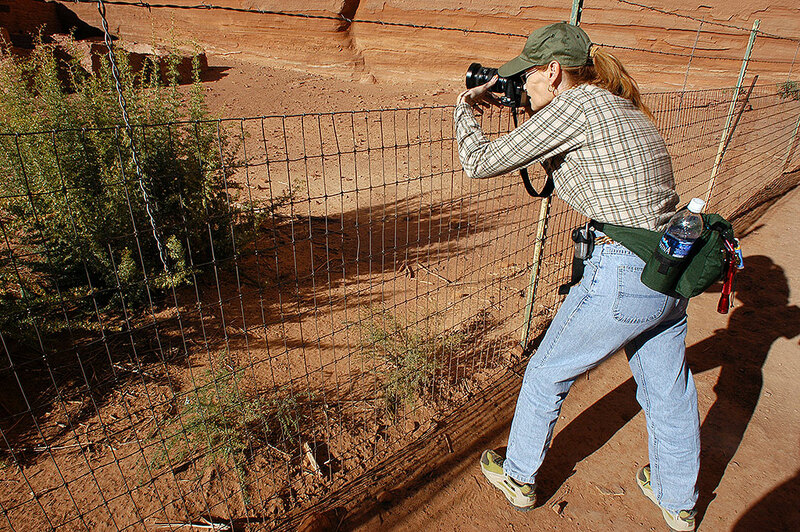 Abby surveys Canyon de Chelly for photo opportunities. 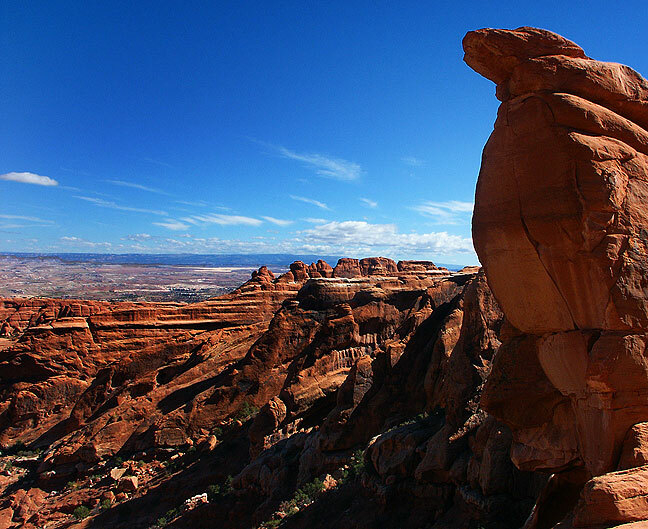 This view from a precipice above Delicate Arch shows our wedding party, the Arch, and in the distance, the open beauty of Arches National Park. This view was made just moments before the wedding ceremony at Delicate Arch, showing Abby and me as tiny figures on that magnificent landscape. Only my own wedding ceremony was more beautiful, and you shot that, too. 🙂 A great read, smooth transitions, and of course the art is second to none.